Presentation, synchronization & response timing validation. Complex real time timestamping and TTL event marking/TTL triggers. Example usage Independently check the onsets and durations of stimulus images, sounds or event marks against responses. Also lets you tune your experiment generators accuracy in a particular study by automatically simulating a human participant that is millisecond accurate. This enables you to modify onsets, delays and RTs so that they are accurate in the real world. Show me a worked example. 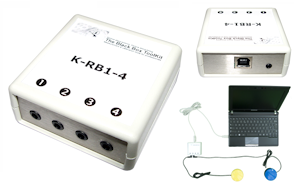 Timing critical independent TTL event marking of stimulus images, sounds, TTL inputs or response pad button presses on EEG machines or eye trackers. Create TTL triggers quickly, easily and reliably in EEG, fMRI or any cognitive paradigm. Show me a worked example. Acts as a USB parallel port replacement to allow basic TTL event marking/TTL triggers from any experiment generator that supports a serial port. Software Full PC suite for programming, control and timing analysis. API available for advanced users. Full PC suite for programming, control and event marking and response monitoring. Can also be used independently without a PC using 10 on-board profiles stored in RAM. API available for advanced users. Basic configuration and latency testing PC software. Basic API available for event marking. Nominal timing characteristics Onboard timing chip for real time accuracy. Sub-millisecond accurate. Timing accuracy independent of PC or experiment generator used. Onboard timing chip for real time event marking accuracy. Sub-millisecond accurate. Timing accuracy independent of PC or experiment generator used. Hardware capable of sub-millisecond accuracy. Timing accuracy tied to PC and experiment generator used. Main function Accept responses on up to 8 buttons. 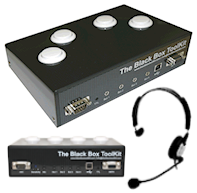 Accept responses on up to 8 buttons and vocal response via a mic. Accept responses on up to 4 external buttons or hand-held triggers. Example usage Turns a button press into a USB keyboard keystroke as if a key had been pressed on a real keyboard. Turns a button press or vocal response into a USB keyboard keystroke as if a key had been pressed on a real keyboard. Turns an external button or hand-held trigger press into a USB keyboard keystroke as if a key had been pressed on a real keyboard. Nominal timing characteristics Full Speed USB keyboard HID with 1 ms latency (1,000 Hz). TTL event marks sent in real time with sub-millisecond accuracy. Response accuracy tied to PC and experiment generator used. Full Speed USB keyboard HID with 1 ms latency (1,000 Hz). TTL event marks sent in real time with sub-millisecond accuracy. Response accuracy tied to PC and experiment generator used. Full Speed USB keyboard HID with 1 ms latency (1,000 Hz). TTL event mark sent in real time with sub-millisecond accuracy. Response accuracy tied to PC and experiment generator used.